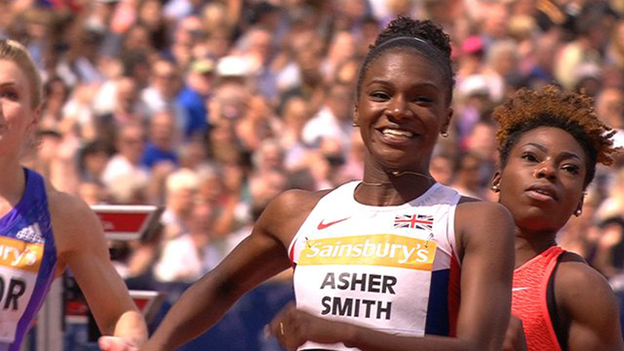 Dina Asher-Smith became the first British female to dip under 11 seconds in the 100m with a brilliant 10.99 to win her heat at the Anniversary Games. The 19-year-old, who bettered her previous British record by 0.03 secs, finished fourth in the final (11.06) - a race won in a national record 10.92 by Dutchwoman Dafne Schippers. Two British records were broken within minutes at the start of the day as long jumper Shara Proctor leapt 3cm beyond her previous record of 6.95m to win her event. 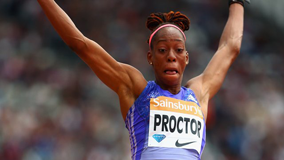 Proctor was competing against compatriot Jazmin Sawyers (6.66m) who was second, European Indoor pentathlon champion Katarina Johnson-Thompson, who finished fourth (6.50m), and Jessica Ennis-Hill. The Olympic heptathlon champion recorded a season's best 6.37m to finish seventh in the long jump before also achieving a season's best 23.49 in the 200m, boosting her confidence before she decides whether to compete at next month's World Championships. Barring injury, the 26-year-old Proctor is certain of going to Beijing, leaping further than ever before with her last effort and later saying there was "more to come". "This crowd is what helped me the most," said Proctor, competing in perfect conditions before a 50,000 crowd at London's Olympic Stadium. "They gave me that extra boost. I did not expect to jump 6.98m. This place gave me the chills, it's the greatest place to jump." Rutherford, who said he ran like a "doughnut" in winning his British long jump title this month, was short of his season's best 8.35m as he jumped 8.18m to finish third in the long jump. But the Olympic champion was against two of the four men who have leapt further than him in 2015 and it was they who finished ahead of him in London. America's Marquis Dendy (8.38m) won the competition, with South Africa's Zarck Visser (8.21m) second. "It was incredible," said Rutherford of the warm reception he received as he stepped out on to the track. "The emotions were running quite high when I walked out, that was an incredible experience. Sadly, the competition didn't go as planned, to finish third I'm quite upset." 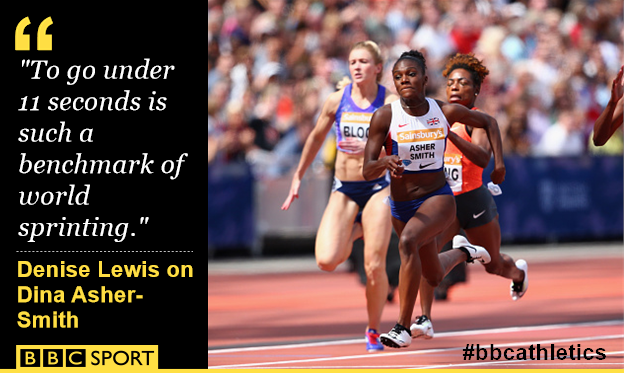 Will Ennis-Hill go to Beijing? Ennis-Hill said she was pleased with her three performances at the Olympic Stadium over the weekend and said she would decide on Beijing once she had reviewed the weekend with her coach Toni Minichiello. Injury and motherhood have meant the 29-year-old has competed just once in the heptathlon - a fine fourth place at the prestigious Gotzis meeting in May - since her never-to-be-forgotten triumph three years ago. "I'm really made up with my hurdles," said Ennis-Hill, referring to her 12.97-second run over the barriers on Friday night - just 0.25sec slower than the personal best she set in this stadium in 2012. "I'm finding my form and things are coming together. I definitely need to sit down and go over my performances and have a real conversation with what we can achieve if we go to the Worlds." Former world marathon champion Paula Radcliffe, speaking on BBC One, said: "Jess doesn't want to go to Beijing if she's not going to be in contention to win, so that's a consideration. She wants a good winter too, ahead of Rio next year. She won't want any niggles being carried over." The day's highlight happened at its beginning when Londoner Asher-Smith, competing in the stadium for just for the second time following her appearance in the 4x100m relay on Friday night, created history again. Britain's fastest woman, who was carrying boxes of kit to and from the stadium during London 2012, has developed into an European force, twice breaking the British record in two months. On a world level there continues to be a significant gap. Her best is the 17th equal fastest of the year and 0.25secs adrift of Olympic champion Shelly-Ann Fraser-Pryce's world-leading time of 10.74. But the world junior sprint champion will not be 20 until December and is not yet a full-time athlete, combining athletics with studying for a history degree at King's College London. In the final she started well but was overpowered by double European sprint champion Schippers, Nigeria's Blessing Okagbare-Ichotegunor (10.98), who was second, and Murielle Ahoure (11.01) of the Ivory Coast who completed the top three. David Rudisha's 800m world record on this track, when he became the first man to run inside one minute and 41 seconds in the event, was one of the memorable moments of the London Olympics. But, because of injuries, the Kenyan is not yet the athlete he once was and was overtaken in the final stages by Commonwealth champion Nijel Amos, who crossed the line 0.10secs ahead of the Olympic champion in 1:44.57. The man from Botswana again dominated his rival, securing his sixth victory over Rudisha in seven races. Michael Rimmer came fifth and European junior champion Kyle Langford was seventh with a lifetime best 1:45.78. Lynsey Sharp secured a season-best 1.59.57 in finishing third behind Kenya's Eunice Sum in the women's race. European 400m champion Martyn Rooney faces an anxious wait over whether he will be selected for Beijing after finishing a disappointing seventh (45.73) in the 400m. With Rabah Yousif, who was sixth (45.43) in the same race, and Jarryd Dunn having already qualified by finishing in the top two at the British Championships, selectors must choose between Rooney and European silver medallist Matthew Hudson-Smith. The squad will be announced on 27 July.